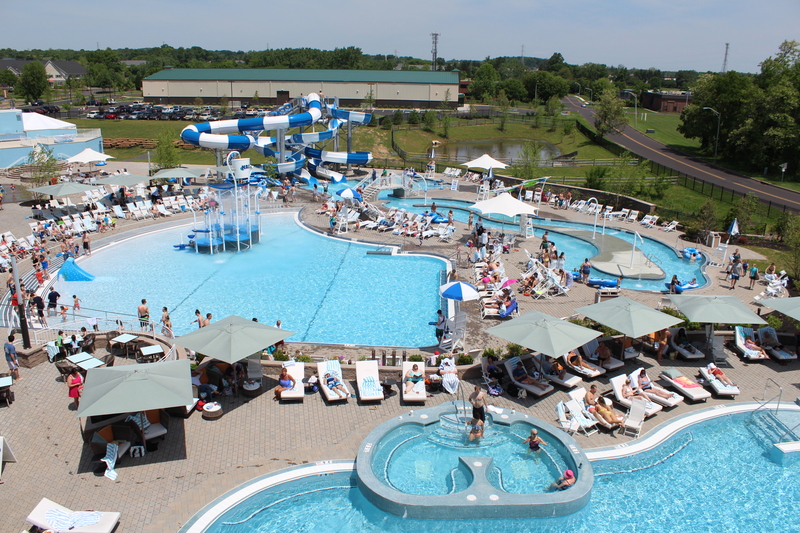 Following up their $8.5 million “Big Build” project – which created a brand new state-of-the art cardio center and the much-buzzed about outdoor pool complex – the Newtown Athletic Club just announced plans for a 12-step $10 million expansion! 1. The renovation and expansion of our men’s and women’s adult locker rooms to be double in size and scope. Due to our membership growth over the past 2 years, we know this area needs to take priority in any expansion strategy. Our vision is to design adult locker rooms that are luxurious and relaxing offering a resort style environment that will make your regular NAC visits even more enjoyable. 2. The Fitness Center will expand to include a large group training area for small group training trainer directed continuous loop classes that will be included in the membership. In addition, the TRX training area will double in size enabling more effective use of specialty training products. Our fitness center is already recognized as one of the top in the nation; however, with these additions our members will have even more opportunities to create fitness habits that will last a lifetime. 3. The Urban Allure Salon and Spa will be reconfigured on the main club level, instead of both levels; featuring a new entrance to the Sanctuary Spa on the main level, while offering high end retail products and customized environments for relaxation, rejuvenation and therapeutic services. Our goal is to offer the style, status and amenities of a five star resort salon and spa located in the heart of your community. 4. The NACafe will be expanded to include far more seating as well as a larger more advanced indoor kitchen. We will create a true restaurant environment for both families and adults that will rival an upscale destination casual dining experience. 5. On the upper level above the new NACafe area we will create a one of a kind outdoor exercise deck from an exciting vantage point overlooking the surrounding area. The participant will benefit from not only the fresh air experience, but also from the healing properties of sunlight as an alternative to indoor exercise in the warm weather seasons. 6. The group exercise studios will be renovated and expanded to feature not only state of the art equipment, but also boutique style individual studios for the various exercise modalities including; Spin, Zumba, Pilates, yoga, strength training and more. Each of these areas will have its own brand (look, style, and name) in order to promote our true expertise and creativity for the already wide variety of proficiency that we offer to the member experience all under one roof. 7. A heated 3-lane outdoor lap pool will be built adjacent to our indoor Jr. Olympic size pool to allow outdoor lap swimming all year round. One will be able to access this pool by swimming though an underwater tunnel between the current indoor pool and the new outdoor pool. We are thinking of possibly including an outdoor hot tub spa with this pool configuration. What we are envisioning is as yet unheard of on the east coast. 8. The TechnoFit studio will relocate to the rear of the building to be included in the newly expanded area which hosts the various new group exercise boutique style studios. The boutique stylized TechnoGYM brand is a proven commodity for our mature market as well as elite athletes and those enjoying the unique blend of outcome tracking and cutting edge technology which this area provides. 9. The current TechnoFit area will be reconfigured into, administrative and membership services offices, as well as a Wellness Center featuring programs and services offered through our new medical wellness partnership with Aria Health, called the NAC/Aria Project Wellness. By locating this wellness amenity near the front lobby, we will be able to more conveniently engage our members in all the added benefits this partnership brings. 10. On approximately one acre of outdoor recreation space adjacent to our Escape Outdoor Resort Style Pool Complex we will develop some exciting new services including a pavilion for teens with social and recreational activities, an outdoor sand volleyball court and a full outdoor basketball court. The purpose of this area will be to increase our offering of available and appealing activities for both pre-teens and teens, as well as families. 11. On the other side of Penns Trail at the corner of Penns Trail and Pheasant Run, a 2-acre outdoor fenced in green athletic field area will be utilized for camps, sports activities and other events that we can hold on our 22-acre complex. 12. A $400,000 underground tunnel (our first choice) or a walking overpass will be built across Penns Trail in order to access this outdoor field area safely and efficiently. We know of no other health club in the nation that has ever built this type of passageway to access another service area of their facility. PConstruction is set to begin on July 15, 2015 and is projected to take 18 months to complete. Of course, members want to know, “How will this expansion affect membership fees? The answer is yes, they will increase, but not because of the expansion and not very much. Every year since we were founded, the NAC has incurred an annual rate increase in January of only 2 – 3%. Last January (2014) there was no increase because there was a large increase the previous June (2013) when we completed the Big Build Expansion. That increase was significant because we shifted the paradigm of who we were as a club. After the completion of the Big Build, we finally made the leap into becoming not just a health club, but truly a lifestyle club. Now that we have achieved that goal, we will return to our annual “cost of doing business” increase. This increase represents the increase in operating expenses as well as increases to our employees. Even if we raise the dues only $5 per month on each of our 5,000 membership units that increases our membership revenue by $25,000 each month or $300,000 annually. At that rate it would take over 33 years to pay off the cost of a $10 million expansion. As any business, we manage our expansion through loans from the bank and pay back the loans over time, just as the mortgage on your home. To put this into some context, a dues increase of $300,000 annually is only a 2% increase over our $16 million annual budget. That amount barely barely covers the cost of increased operational expenses. So again, the answer is yes the rates will increase, but only as a reflection of the cost of doing day to day business, not as reflection of capital expenses for expansions. You an find more images and questions answered about the expansion here.